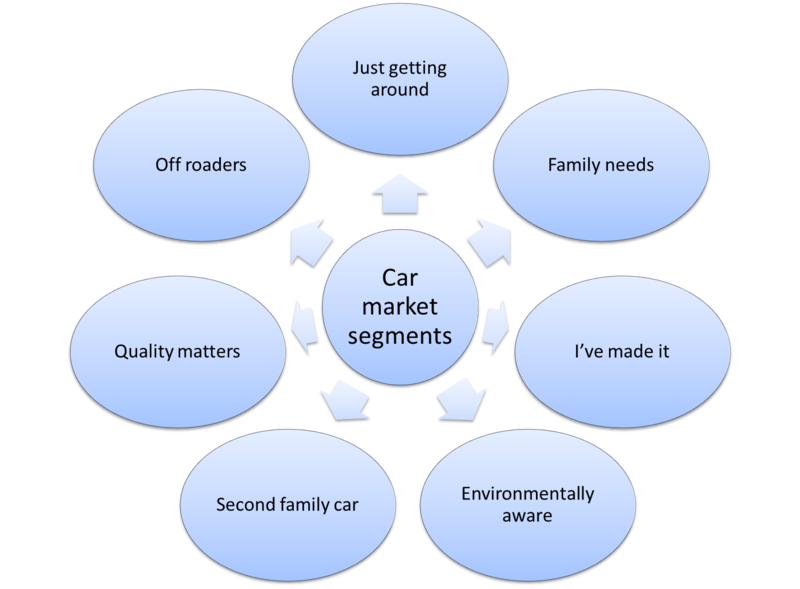 There are a variety of ways of segmenting the market for cars. 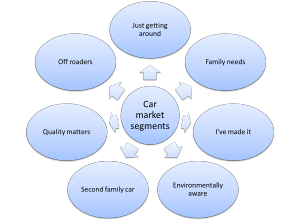 Remember that market segmentation should be focused on consumer groups and their needs, not on the class of car. This means that classifying different types of cars (such as sedans, people movers, convertibles, and so on) is NOT an acceptable approach to market segmentation. These types of cars are product solutions designed to meet the needs of specific consumer segments. Consumers in this particular market segment view cars as having a functional benefit only. They do not perceive cars to be status symbols and do not see the value in paying extra for quality inclusions, a bigger motor, or other surplus options. In their mind, a car simply is a transportation device they get you from point A to point B. These consumers are highly interested in lower priced cars that represent good value for money. Usually they attracted smaller vehicles without many additional options. They generally quite price sensitive and attracted to special deals. They are more likely to switch between brands, as opposed to the other consumer segments. This market segment consists of an established family with children still in the household. Therefore, they need a larger, more comfortable car to move their family. They attracted to product features that benefit their family needs – such as, larger seating, drink holders, entertainment units. Safety is also another important factor, as is reliability, and a brand of car that is acceptable to the whole family. As suggested by the segment name, this particular group of consumers is primarily interested in the social status benefits of a particular car brand. It is important to them that they communicate their career or business success (or role in an organization) by purchasing a more expensive car. This group of consumers is attracted to brands of car that are considered high status and are more interested in brands that have social recognition benefits, rather than the particular features of the car. An emerging market segment consists of consumers who take environmental factors into account in their purchase decision of a vehicle. They are concerned with the impact that their car has on the natural environment. This is the market that is more attracted to hybrid or electric cars, or smaller cars with a lower level of fuel consumption. It is important that the brand of car has a reputation for being environmentally concerned. The second family car segment is a subset of the family needs market segment. This is for families with both parents working, or with teenagers who are now driving. They have similar needs to the other family segment, but because this is a second car primarily for shorter travel, they are less interested in the comfort features. They are typically seeking a lower-priced alternative for a larger vehicle, without the added extras of options like entertainment units. This group of consumers will typically spend a little bit more on their motor vehicle purchase. They are looking for technically advanced cars that have the latest features, as well as higher quality finishes throughout. They differ from the “I’ve made it” market segment because they are less interested in the status symbol of the brand, and are more focused on the product quality and features. The final market segment in this example are those consumers seeking a vehicle for a particular purpose, such as taking their vehicle off-road into difficult driving situations. These consumers enjoy off-road driving often as a social activity. They are clearly looking for functional benefits to undertake this style of driving, as well as safety and reliability benefits.